My work has always contained elements of universal stories, presented as a conglomerate of borrowed religious, and personal, iconography. Its purpose is to stimulate correspondences of similar scenarios, and accompanying outcomes, in the mind of the viewer. They're meditative pieces that I present in a humorous, contemporary eye-catching way. In that sense, they're similar to works in a medieval Book of Hours. These books were commissioned by royal families to contain prayers, illuminations of life in their kingdom, and images of their favorite spiritual role models. I've been working to present my work in historical context by juxtaposing my iconography within the compositional context of these books. As always, I hope that such a juxtaposition will be the crowbar that opens a viewer's mind to a different view of their life journey. I've completed three works within this framework: The Artist; The Annunciation; and shown here Vanitas. You can visit with all three in person at Ghostwolf Gallery. I'm usually at the gallery on Thursdays, and I'd love your company. 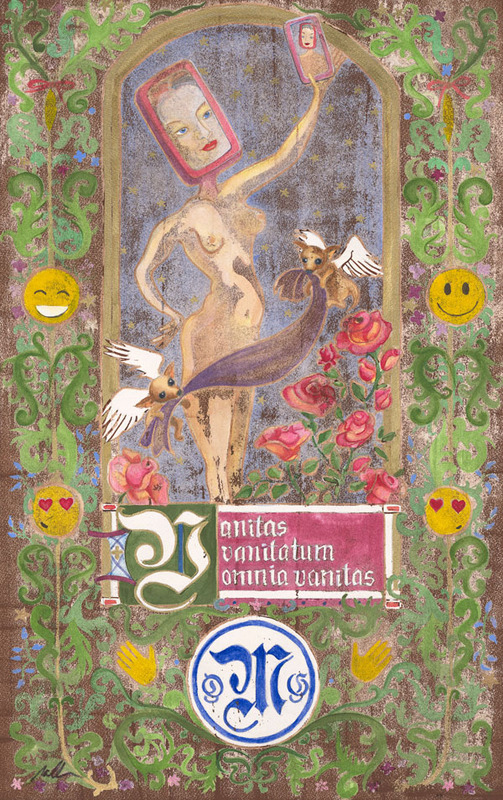 Shown here: Vanitas incorporates social media iconography: waving hands; a variety of smiley faces; and the pervasive OMG. The Latin inscription, under the image, translates to "Vanity, vanity, all is vanity."